Image credit: [Flickr] Ryan Sorenson. Licensed under CC2.0. I have heard the argument many times that most police officers are caring, upstanding citizens who are forced to work with thugs. Yes, I do believe there are some good officers out there. I read their stories of delivering babies on highway shoulders, saving suburban house from robberies, pulling over drunk drivers before they hurt someone. But Eric Garner, Michael Brown, and countless other people, mostly black and/or poor, have died under the oppressive suffocation of the dark side of policing. It seems that the violent officers run the game. The good officers keep their mouths shut and won’t or can’t stand up for righteousness. I have experienced this personally. A terroristic officer pointed his gun at me and screamed at me to get down, while I was hobbling on a broken ankle and holding my two-year-old son. He violently arrested my husband on bogus charges. The other officer with him was gentler, even apologized to us, but he said that the rough officer was his superior and he had to “follow orders.” Why don’t these good officers stop the bad ones? The violent, murderous officers run the game, even if they are a small percentage. They know they can get away with it. They abuse and kill victims, and never even face trial. They act above the law, because they ARE above the law. They can get away with murder. Grand juries almost never indict them, as shown so publicly with the Michael Brown and Eric Garner cases. I Can’t Breathe. It’s On Camera. People can argue all day about whether Michael Brown was a thug. There was no tape evidence. But the Eric Garner homicide by police was caught an tape. He was no thug, no threat to the life of the officer. Eric Garner was put into a choke hold by New York City police officers, a maneuver so dangerous to victims that it is forbidden by the force. And what did Eric Garner do to trigger this violent procedure? He sold cigarettes on the street without collecting taxes. Hardly the crime of a violent thug. Certainly not a crime deserving of the death penalty. The police said that Eric resisted arrest. Yes, he asked why he was being arrested. That is his right as an American citizen. He is innocent until proven guilty. Asking a question, or even accusing the officers of harassing him, does not qualify as assisting arrest. And it certainly does not justify a deadly choke hold. The entire disturbing scene was caught on camera. Eric Garner never acted in a threatening manner toward the police. He plead for his life even as they choked the breath out of him. “I can’t breathe,” he cried, dying. Why didn’t the officers let go? If the police are such good people, why didn’t they listen to his cry? The callous officer who filed the first report did not even mention that a choke hold had been used (New York Daily News). The violence may never have come to light if a witness had not recorded the scene on camera. The medical examiner’s report did determine Garner’s death a homicide (Los Angeles Times). The determination of homicide forced the involved officers to go before a grand jury. Even this was of little consequence. Despite the camera evidence, despite the medical evidence, the grand jury let the cops walk free to commit violence again. 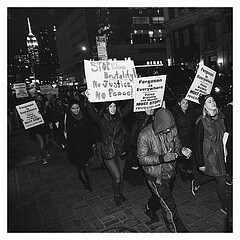 The American justice system committed the homicide against Eric Garner. Because of American sanctioned police violence and American racism, this police crime will never come to earthly justice. But the heavenly cameras are always rolling, and this crime will not escape God’s holy justice. How many of these police officers attend church, call themselves Christians? How many white Evangelicals say police racism doesn’t exist, police must kill to protect us? Jesus did not die on a cross for people to commit such horrible violence. Jesus was a friend to the poor and oppressed. People like Eric Garner. I Can’t Breathe. I Have Asthma. Eric Garner had asthma. This contributed to his death. The police should never put someone in a choke hold, especially a victim with asthma. I can’t breathe. I know that feeling well. I empathize with Eric Garner. l, too, have asthma. Unlike Eric, my skin is white. The police never put me in a choke hold. I believe this was a prophetic sign and judgment of what would soon happen in New York with Eric Garner. I wrote this poem in February 2014, when I lost my job to asthma and evil people in authority. I dedicate this poem to the memory of Eric Garner, who lost his life to asthma and evil people in authority. Eric, you are a martyr at God’s throne. Jesus holds you in his healing arms. Rest in peace from your earthly pain. Someday there will be holy justice.